The B-17G Sentimental Journey is a restored World War II B-17 Flying Fortress bomber regularly flown in airshows across North America. Known for its distinct nose art of Betty Grable, the most popular pinup girl of World War II, Sentimental Journey was built in 1944 with the serial number 44-83514 and entered service in the Pacific Theater a year later. After the war ended, the bomber went through a variety of missions, including being used for photo-mapping in Clark Field in Manila, Philippines, directing unmanned B-17 drones as a mothership during nuclear tests and fighting forest fires in California, until it was donated to the Arizona Air Wing of the Commemorative Air Force in 1978. After extensive restoration in 1981, Sentimental Journey has become one of the last intact and fully operational B-17s today. The B-17 Sentimental Journey keeps the legacy of the B-17 Flying Fortress alive and will do so for years to come. 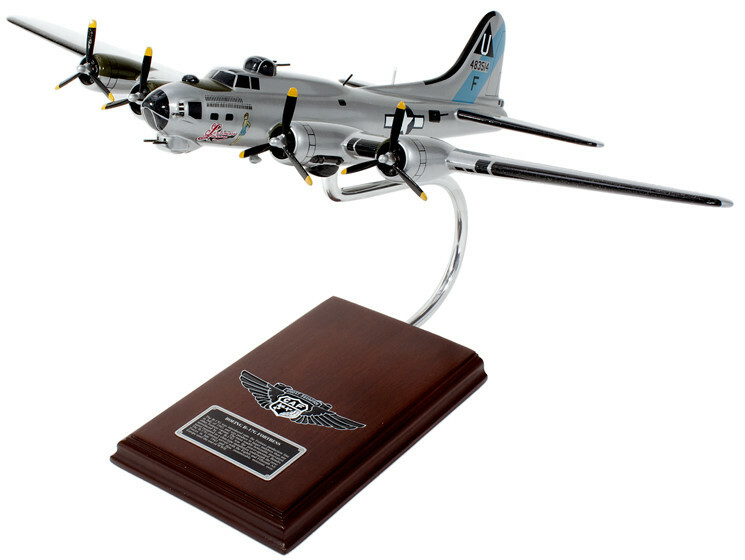 Celebrate this legendary piece of military aircraft history with the B-17G Flying Fortress (Sentimental Journey) 1/62 scale model aircraft. Crafted from fine quality wood, each model is an accurate scale replica of the restored B-17G Sentimental Journey strategic bomber aircraft. It also comes with its own wooden base for easy display straight out of the box. Get yours today.